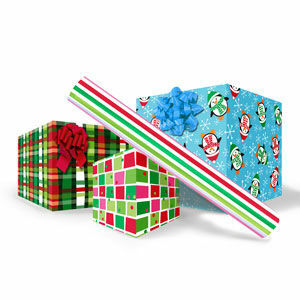 These giftwraps are 24" x 50' rolls and all the same price, $12.95 per roll. That is a savings of more than 50% on these giftwrap patterns. Since we purchase huge quantities of these patterns we get a great price that we pass on to you. Our handy to use rolls measure 24 x 50. These are in our Denver warehouse for immediate pick up or shipment. Only these patterns are at this price.